Press « Shuffling Along . . . . . THERE are endurance athletes, marathon runners and ultra-distance runners – and then there is Colin Fitzjohn. 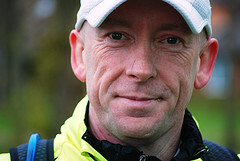 Starting in April next year, Colin will be part of a 16 strong team attempting to run the 860 miles from John O’Groats to Lands End in 16 days – the equivalent of around 55 miles or over two marathons every day – and organisers of ‘JOGLE 10’ think maybe only one or two of the team will succeed. When he joined the Dashers, Colin was inspired by the then club chairman Shane Gudgeon who completed the 54-mile London-Brighton race. training with Shane, Colin quickly progressed beyond the marathon to complete the 39.3 mile Connemara International ultra mara-thon in the West of Ireland. His progress was halted last year by a tear in his left calf which necessitated a lay off for six months and it was while recuperating that Colin started looking for a new challenge. The New Year saw him return to action, slowly building to runs of three or four miles, then mountain biking with Dasher Simon Fox. Colin spotted that the well known ultra-distance runner Rory Coleman was going to attempt to run the JOGLE route often used by cyclists and immediately enlisted to be part of the team, but still had to undergo a time trial to prove his capabilities. By the time it came around he was training frantically, running 180 miles a week and covering 40 miles off-road biking as well as doing 300 sit-ups. The trial replicated the 11th and 12th days of the actual run, from Wigmore in Wales to Taunton in Somerset – 58.3 miles plus the length of the Severn Bridge on Saturday, and another 55.3 miles on Sunday. After struggling with blisters, a swollen ankle and shin, he finished and earned his place in the team. More races have followed with marathons at Edinburgh, Loch Ness, Anglesey and Snowdonia which were supplemented with the off-road Moors the Merrier Marathon at Mytholmroyd where he got lost and ran 37 miles instead of the scheduled 26. His second big trial was the 85 mile long Ridgeway Challenge. The cut-off point was set at 28 hours and Colin had hoped for 24, but he took just 20 hours and 23 minutes to be 16th of the 68 finishers. Last weekend, eight of the prospective JOGLE runners tried out two more legs of the route, starting at Preston and following the A49 to finish at Church Stretton with an overnight stop at Tarporley. Colin ran through a sdtorm and against a 70mph gale force wind but was boosted with the news that he ran his fifth and final ten miles on Saturday faster than any of his colleagues.